I'm proud to say, due to the popularity of my floofy hair in my art, I'll be creating hair-related romantic content exclusively from now on. 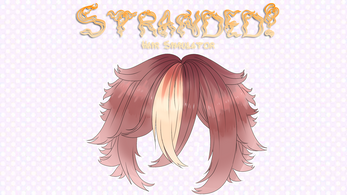 Here is a sample hair-em for you to enjoy! Over three emotions to choose from! Over 24 conversations to be had! Choose from either Ginger, the Tsund-hair-e or Harry, the Childhood Strand! A few months ago, I fell into a state of artwork anxiety, which caused me to spend a lot of time on Deviantart practicing for Celestial Dance. I then ended up releasing the demo to a selective audience and then realized that CD stressed me out beyond belief. It had completely drained me. There was no more creativity, no more passion. 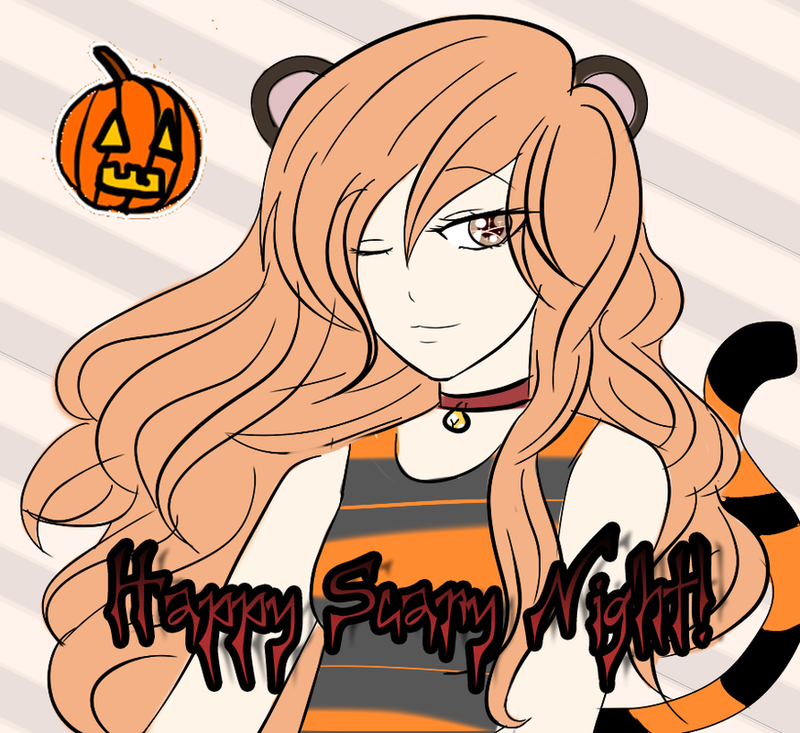 I decided to take a month off in March to work on school, before realizing that March coincides with the visual novel gamejam, NaNoRenO. Then, for Creative writing, I took the three initial characters and adapted them into an eight page short story re-titled "Paper Roses". 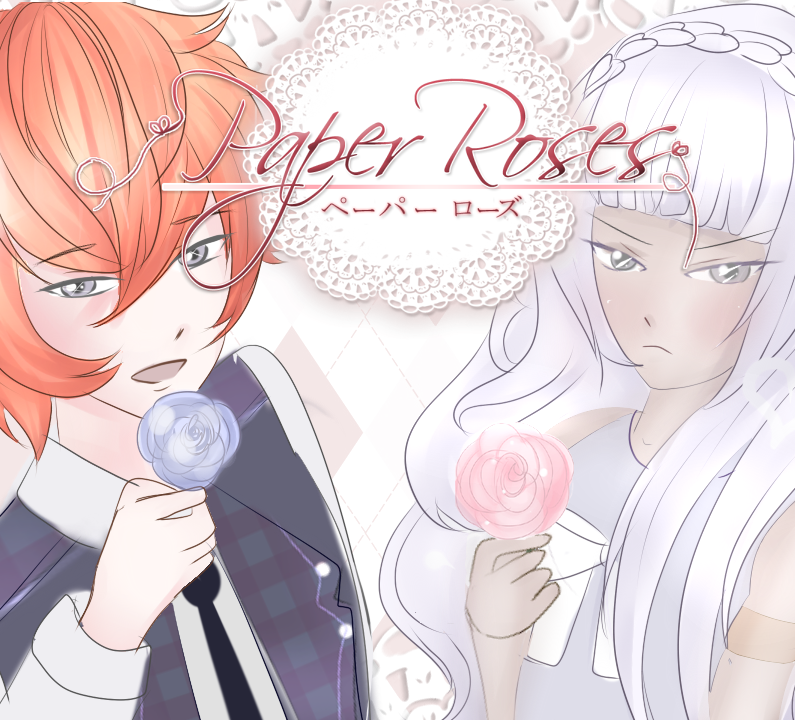 I really loved the world so I designed Kira and Robin and decided to start the game titled, Paper Roses. 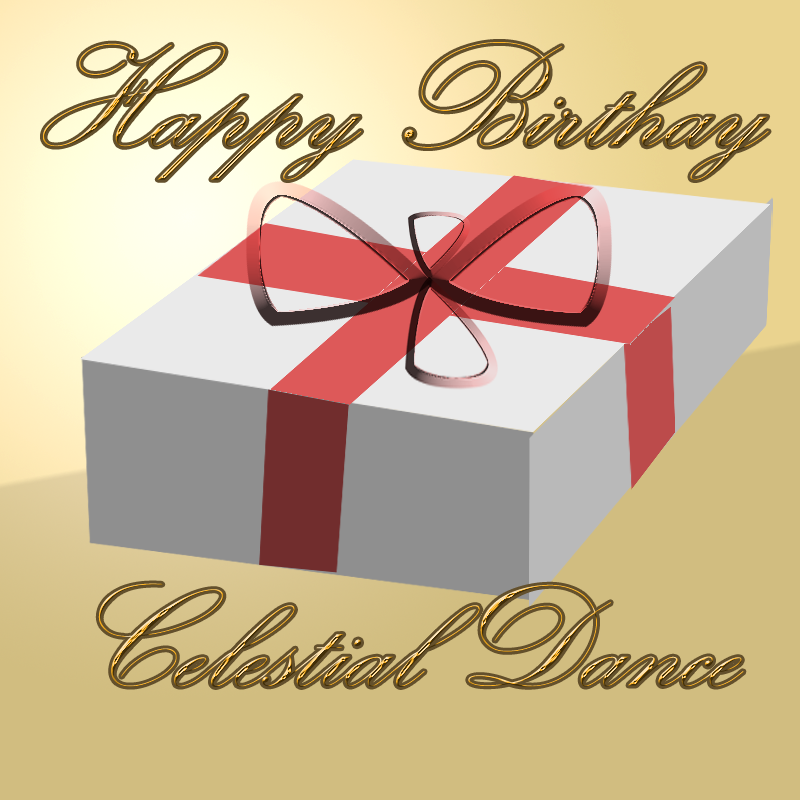 I'm back into Celestial Dance as of tomorrow but it does exist too! The world is situated in a fantasy world where eyes change colour when they meet with their soulmate pair. Kira is a lowly papersmith, a crafter of paper and stationary. Engagement season is high, so people are looking around for roses to propose with, and Kira had the idea to make Paper Roses instead. No one buys them, however, because people want to buy organic and real roses instead, much to her dismay. 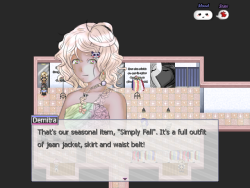 The game follows twenty weeks of Kira's life. You have a choice between 3 love interests: Creed, Iris and Robin. You schedule each week to spend time with each love interest and unlock romantic scenes as you go. Kira is the protagonist in Paper Roses. She lives alone with her bird, Loveless, and works as a paper smith in the market. Her best friend is Robin Akiba, who comes to see her at the end of every work day. Kira can be sarcastic and passive aggressive, but she does her best to keep her friends happy. Robin is Kira's best friend and closest companion. He's straight to the point, energetic and playful, but isn't afraid to be serious when time recalls. It's heavily implied that Kira is secretly in love with him, but can't tell him since they're not soulmates and also in fear of ruining their friendship. Iris is the mysterious princess that appears at Robin's door. She grew up a rather isolated life in the palace. Iris is a bit of a himedere, but has some heart to her as well. Creed is Robin's younger adoptive brother and edgelord of the game. He think he's cool and tough but he's scared of everything, especially things shaped like animals. Creed is Kira's friend but is younger than her by several days and, much to his dismay, she never lets him forget it. Luvina works, unpaid, as the official seer to princess Iris. Being sold to the family, Luvina uses her premonitions to help guide Princess Iris through her life. Luvina takes things too literally, making it difficult to communicate with her. Loveless is Kira's childhood pet and the only other one that resides in her house. Loveless takes a small role to help soothe Kira. ​Happy New year! I would have better art but I procrastinated and ended up having 10 minutes to draw the last three so here’s some crappy art. I apologize to all of those who have tried to get a hold of me the last few days! I've been ultra busy! ;-; I'll get back to you all soon! 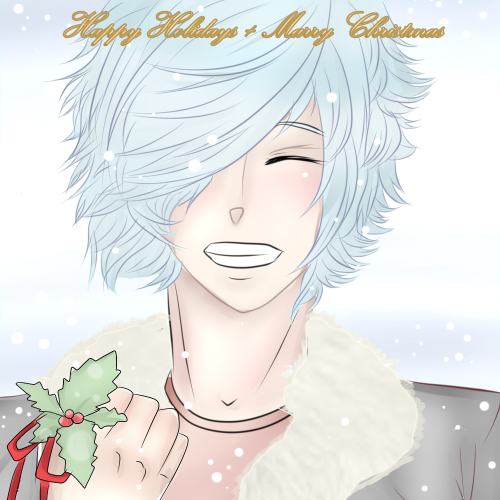 Merry Christmas + Happy Holidays! Merry Christmas, pretty! You celebrate, ne? We don’t over in Araysia but it sounds so fun~! …huh? No? What do you mean that’s not how mistletoe works? Cheyenne hands you a box and walks away. The tag reads "For the followers of the game. Open this in one week's time." The box is barely weighs a thing. It seems to be some sort of box beneath white wrapping paper. You shake the box slightly, but it makes no sound. You listen to the instructions and put the box aside until you're allowed to open it. The summer has reached the sweet end, with the leaves slowly bursting to bright orange and reds, new season teasing at the horizon. The beauty of the oncoming autumn is accompanied with the bittersweet farewell of both the summer and your home, starting anew in the sleepy town of Araysia. With your mother, you take on the challenge of beginning again, finding yourself and making friends and eventually starting a family of your own. 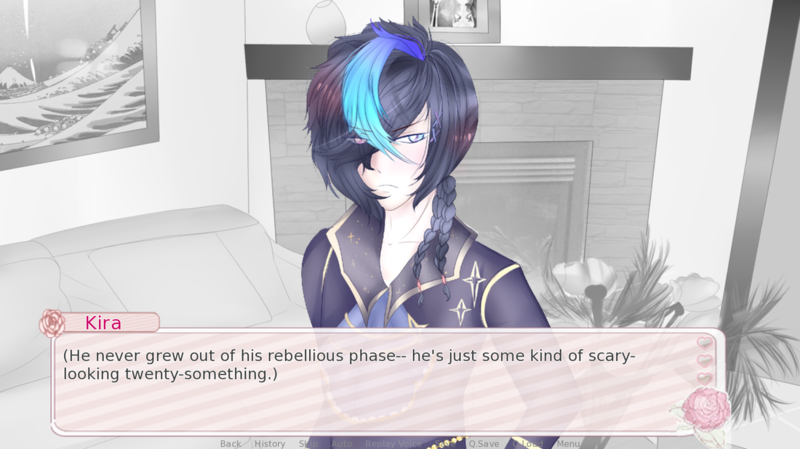 At it's core, Celestial Dance is an Otome life sim with visual novel elements. The story spans 20 years of your hero's life as you create them to be the way you want them to be, from appearance down to the specifics of their personality, foods they like, fanbases they're apart of. In Chapter 1, you begin as an eight year old child moving to the town for the first time. By the end of the game, you would have been able to fall in love, follow the route of the love interest of your choosing, get married and start a family if you choose. Anime style graphics, CGs and animations sprinkled through the game. The demo has officially been completed with the exception of some artwork, dialogue and cutscenes (Which we can do without for now.) The game is going out for it's first official playtest in two weeks from now. We're hoping for an October release. It will contain 1 in-game week of gameplay including the introduction event. You can sign up for the demo HERE. This means that you will get the demo before it officially drops. You will also get a special outfit for the game. "Why would I play the demo? It's just a week of the game?" Well, we're hoping you can transfer your data over to the final chp 1, which means we're hoping to give bonuses for demo players, early access players and playtesters. Here's what you'll get! Quick note that for the demo's release, I've updated the website and re-started this blog page so everything on this blog from here on out is now dedicated to the slow release of the demo and chapter 1, then updates until CHP 2 and 3's release. Thanks everyone! I probably won't post until the demo is out for playtesting unless I have a gameplay video to share!